Junior pitcher Nathan Woods throws the ball at game two of Saturday's double-header. Baseball lost its first series in more than a month to Richmond this weekend. Fueled by an Atlantic 10-leading and .294 team batting average, the Colonials began the series with a 12-2 record in the last 14 outings. But GW (20-15, 6-3 A-10) could not hold off the Spiders (19-15, 5-4 A-10), winning only the second game 6–0 and dropping both the first game 6-4 and the third contest 5-4. Their one win over the weekend allowed the Colonials to cross the 20-win plateau nearly two weeks earlier than last season. GW was led by senior Isaiah Pasteur, who continued to do damage at the plate from the lead-off position. The third baseman picked up six hits on the series, including a 4-for-5 showing during Saturday’s first game. He finished the weekend action on a 23-game hit streak – one contest shy of the program record. The Colonials gave up a four-run lead in the top of the sixth inning to lose 6-4 Friday afternoon. The Colonials got their chances early at the plate, with Barmakian singling to center on the first pitch at the two-hole. Senior second baseman Robbie Metz followed up by drilling one up the middle in near-identical fashion. Senior center fielder Mark Osis singled through a seam on the right side to bat in the game’s first run. Metz scored soon after on a line out by sophomore shortstop Nate Fassnacht to give the Colonials a 2–0 lead after the first inning. GW’s starting nine put the pressure on the Spiders’ pitcher, taking the count deep on at bats. Richmond’s starter was chased from the mound midway through the fifth after Barmakian’s second hit of the day pushed the Colonials’ lead to 4-0. Sophomore starting pitcher Jaret Edwards was pivotal in limiting the Spiders’ offense early on, holding them to six hits and one run through 5.1 innings pitched. A leadoff double by the Spiders fueled a rally in the top of the sixth, where Richmond took a 5-4 advantage. Junior relief pitcher Pat Knight saw just five batters before getting pulled. 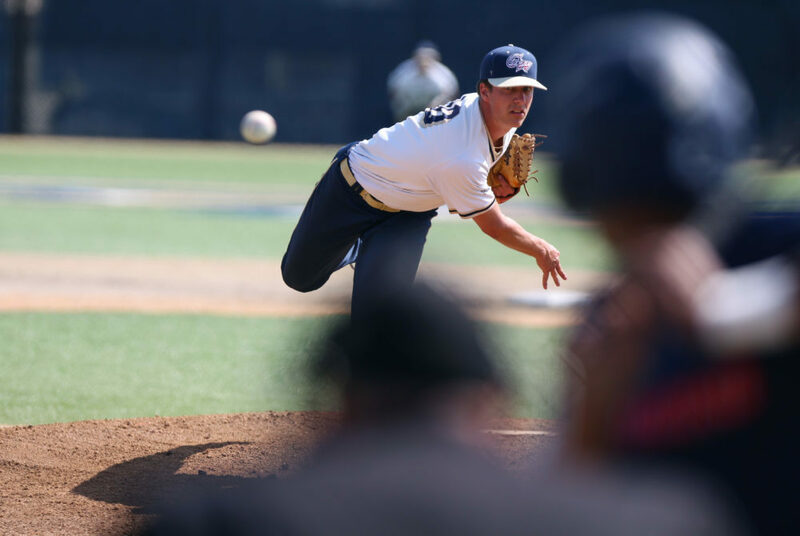 GW’s A-10-leading offense was unable to break through Richmond’s defense, recording just four hits and leaving seven runners on base after squandering the lead. In Saturday’s first game, sophomore right-hander Elliott Raimo led the Colonials to a win, tossing his third career complete game and finishing with nearly 20 consecutive innings of shutout baseball. The final hurdle to his highlight night was Richmond catcher Ryan Shaw – who swung at a 1-0 fastball and lined it straight back at Raimo. After a bobble, the 6-foot-4-inch Albany, N.Y. native made a barehanded catch to seal the Colonials’ 6–0 victory. Raimo now holds an ERA of 1.68 over eight appearances – the third-best mark in the A-10. “I was hitting the zone pretty well and getting batters out early, and got them out swinging,” Raimo said. After a sacrifice fly scored Pasteur in the first, GW found success again in the bottom of the third inning, scoring two runs on four consecutive singles. Redshirt freshman outfielder Colin Brophy had a lead-off base hit, and then swiped second base for his sixth steal of the year. Pasteur later doubled down the left-field line to score Brophy. Two more knocks by Barmakian and Metz – who are both batting over .310 this season – scored Pasteur his second run of the day and put the Colonials up 3–0 early. GW tacked on three more insurance runs between the fifth, sixth and eighth innings to put away the Spiders. The Colonials could not close out the series with a win, dropping the game 5-4 to the Spiders. Richmond jumped ahead with a leadoff home run over the left field wall in the top of the second inning. A level-headed approach by junior starting pitcher Nathan Woods got the Colonials out of trouble, closing the inning with three quick outs. The lineup made contact with pitches but struggled to put the ball in play, with Pasteur’s double to right field in the first standing as their only hit through four innings. The Spiders added to their lead in the third, making it 2-0 on a sacrifice fly to left field in the top of the third inning. In the top of the fifth, Richmond knocked out another home run to push their lead to 4-0, chasing Woods from the mound at the end of the inning. Osis opened the bottom of the fifth with a double to left center for the Colonials’ first hit in three innings. A series of errors by Richmond allowed GW to score twice on a passed ball and a walk with bases loaded to cut the deficit in half. Richmond got one back in the sixth, plating what would stand as the game-winner on a single through the right side with two outs. Regardless of the series loss, Ritchie said his team showed commitment to playing the game their way. The Colonials begin an 11-game road trip when they face off against Virginia Tuesday. First pitch is slated for 6 p.m.